Hello, wind! We’re so happy to see you, especially when you’re blowing out of the north and we’re sailing in the new AYC Solomons Race! 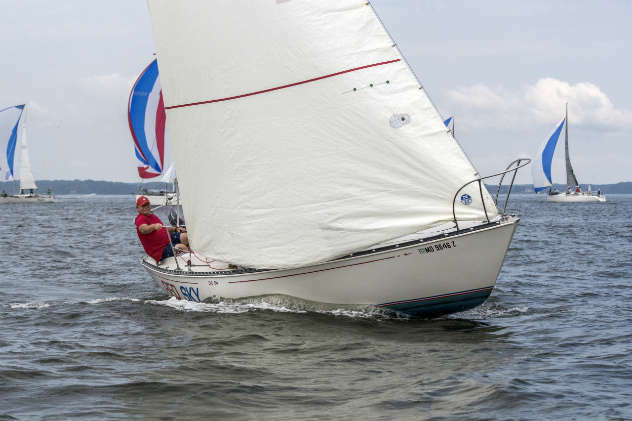 This distance race and a very different style of distance race, the Sunfish Challenge, were two among many successful regattas last weekend. Here’s your SpinSheet racing roundup for the weekend of September 21-23. 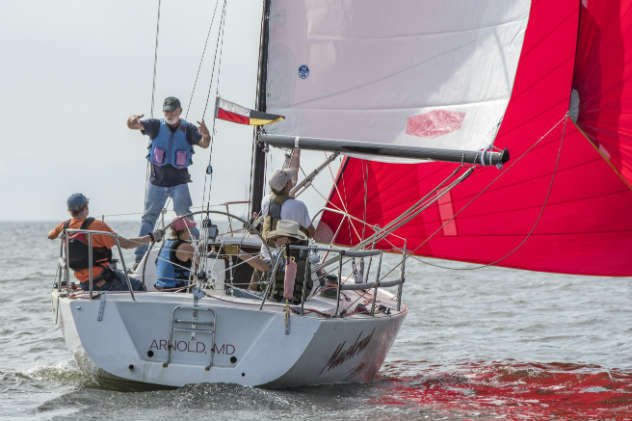 A fresh to strong northeasterly breeze marked the first Annapolis Yacht Club (AYC) Solomons Race, which started at 9:30 a.m. September 22 off Annapolis and ran to the Patuxent River at Solomons. Sixty-seven competing boats did the race. 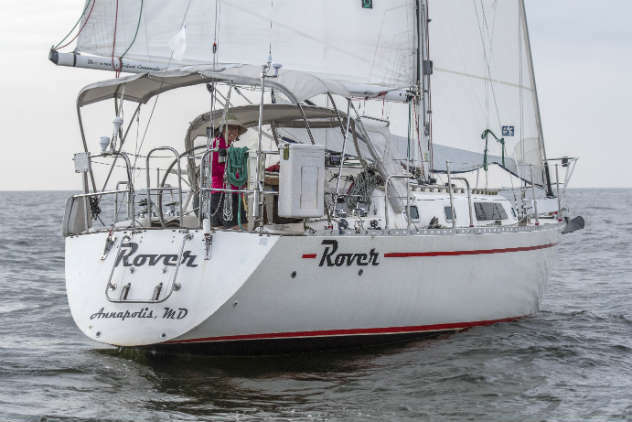 We’d like to do a shout-out to Lauren Anthone on the 34-foot Rover. When her crew member bailed out, she decided to race anyway. She was the only solo skipper! She finished fifth of six in CRCA non-spin… go Lauren! Find Al Schreitmueller’s photos of the start here. Find full AYC Solomons results here. Find Al Schreitmueller’s photos of the start here. Ten years for the Sunfish Challenge!! 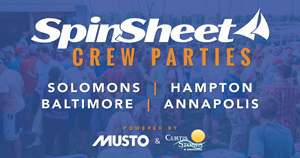 Happy anniversary to our Hampton friends who’ve kept this fun-loving event going and encouraged so many dinghy sailors to dig their Sunfish or any dinghy out of the shed and get back on the water. 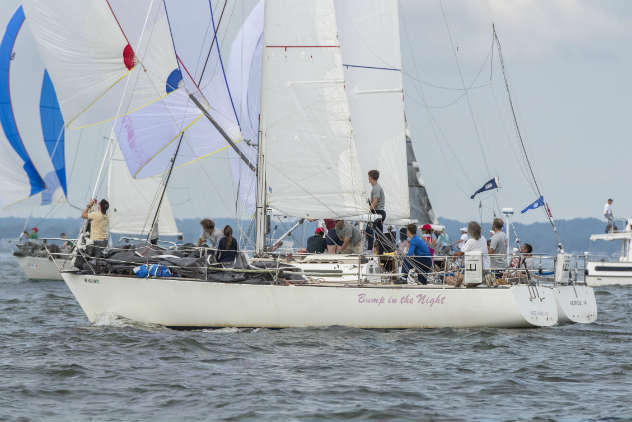 The Race was hosted by Mill Creek Boat Club and Hampton Yacht Club this time around. 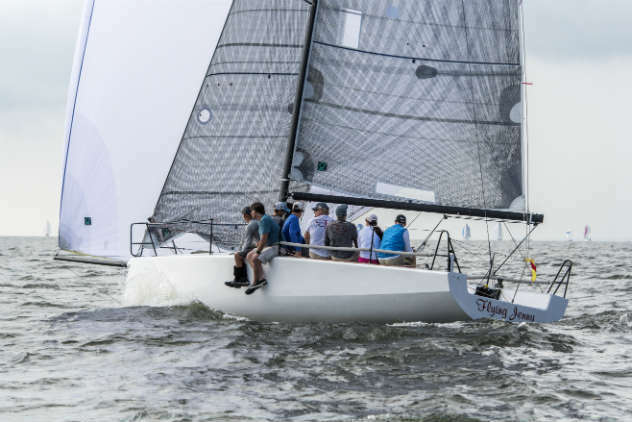 Seventy-nine boats competed in a wide variety of boats and classes: recreational fleet, racing fleet, tandem fleet, Lasers, Force Fives, Comets, Open fleet, Viper, Albacores, A-Cats, Hobie 16, and of course, Hampton One Designs. 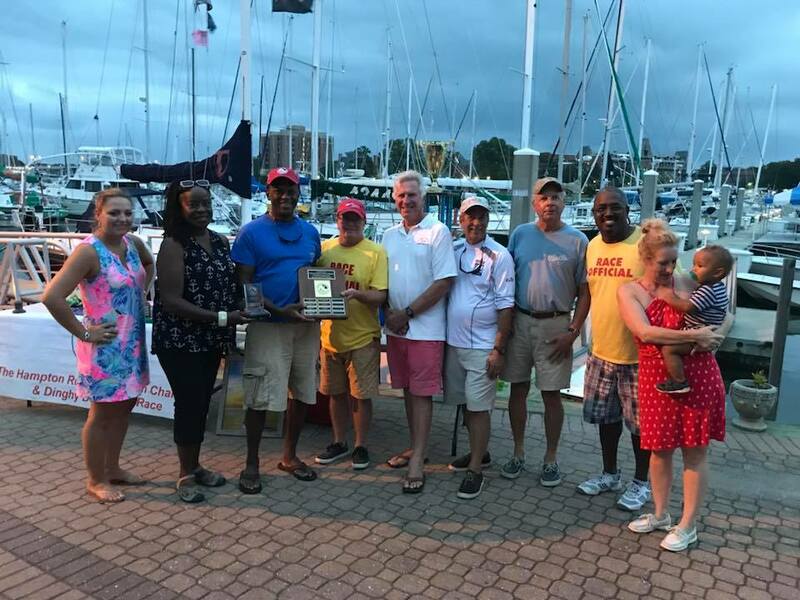 Find 2018 Sunfish Challenge results here. Severn Sailing Association hosted its Laser Crab Claw Regatta over the weekend. Commodore and 2018 Women’s Snipe World Champion Kim Couranz placed first out of 16 in the Laser Radial division. SSA’s David Grace placed first out of 20 in the Laser division. Find full Laser Crab Claw results here. Sixteen teams competed over the three-day J/111 North American Championships hosted by Macatawa Bay Yacht Club in Holland, MI, last week. Annapolis sailor Jim Connelly placed second on Slush Fund. Congratulations, Jim and team! Peter Wagner’s Skeleton Key placed first. 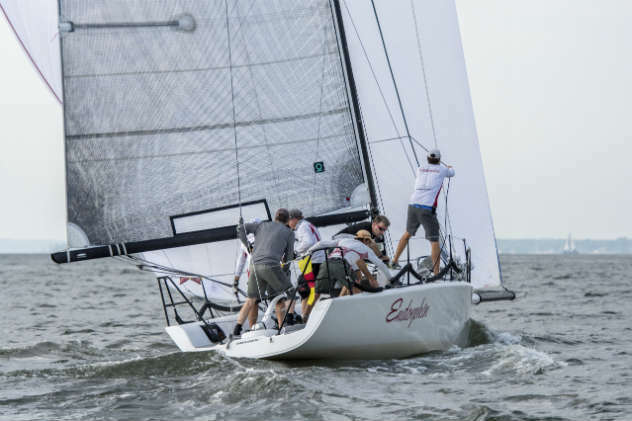 The Opti ACCs were hosted at Little Egg Harbor YC in New Jersey over the weekend. Following his excellent fifth-place performance at the Worlds in Cyprus last month, Tommy Sitzmann sailed to victory! Find full ACC results here. Congratulations to Annapolis sailor Dee Smith! Want to see your news in the racing roundup? 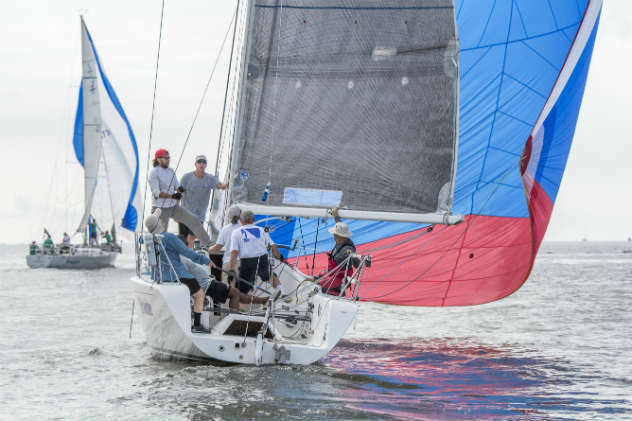 Send us Chesapeake racing news, photos, or tidbits by 9 a.m. on any Monday, and we’re happy to include it.